Big slick pomade co has a great, solid reputation, on the same quality/notoriety level as Pomps Not Dead, Lockhart’s, O’Douds and Shear revival. They offer light, medium (original), firm, heavy pomades and even a super heavy was added to the list lately. The availability of scent options is interesting as well. You can find more handmade grooming in their etsy shop. Yes, Big slick is a versatile grooming company. Today, I will be reviewing Big slick’s first water based pomade. An orthodox or gel pomade, ‘ringing’ gel type with a medium-firm hold. I find it a bit strange that a gel water type shows up in times of the fashionable unorthodox pomades (Note: at the time). Maybe such one is the next step, following the order of the different pomade types through time. The water based has been made by a Californian lab. Vincent and Magdalena were involved closely to deliver good quality, a principle Big slick stands for. After months of reformulating and tweaking, it’s finally there! I quote: ‘Forget what you know about ‘gel-type’ pomades. 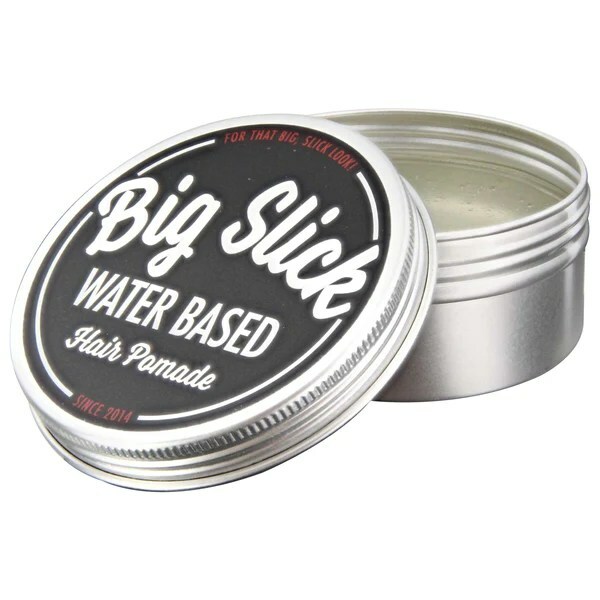 Big slick water based hair pomade combines modern conveniences with the slick look and feel of the classics.’ Big slick water based comes in a tin as we are used of Big slick. Content of 3.4 oz, a tad bigger tin than the others. Pomade is transparent. Water (Aqua), Steareth-20, Propylene Glycol, PEG-40 Hydrogenated Castor Oil, PEG-7 Glyceryl Cocoate, C12-15 Alkyl Benzoate, PVP (Firming Agent), VP/Methacrylamide/Vinyl Imidazole Copolymer, Glycerin, Propanediol, Hydroxyacetophenone, Fragrance (Parfum), Propylene Glycol Dibenzoate, Phenoxyethanol, Polysorbate-20, Phenyl Trimethicone, Cocos Nucifera (Coconut) Oil, Ethylhexylglycerin. Contains coconut oil: a good conditioner. Big slick’s scent description: clean and classic. Someone called this: gin tonic scent. I don’t drink gin tonic, cannot second this. For my nose (as it’s in the jar): cologne type of scent, classic smell, clean, a bit fresh, some sweet notes, some sour notes. Not overpowering, not tart. More of a neutral and accessible aroma for most people. Don’t really dig the scent but it’s okay. In the hair: can’t exactly pinpoint what I smell, it smells less clean, less fresh, some notes of musk. Intensity: subtle, soft scent, not overpowering or tart. I smelled it once in a while during the day. You’ll notice the tin is not filled to the brim but don’t worry, it’s just a bigger container, with a 3.4 oz content. Use of a screw top lid to protect the pomade against humidity and dirt. Close thoroughly after use. Directions: apply damp. Applied it damp, works most comfortable and best for my wavy hair (straightens more, slicker too). 3 around finger tip licks was the amount I needed. The first lick was bigger because of the soft/easy way it came out of its jar. Texture is not thick, feels a tad sticky. Breaking it down goes easy as well. Putting into the mane: no tug, easy to disperse evenly. Slicking back: tiny resistance (using my Denman brush). Part: no problem forming. This pomade lays down the hair with ease and tames my cowlick area and sides very well. Waves not present, nicely managed too. No struggle with strays, flyaways. Slickness: styles fluent and rather quick, no tension or hairs sticking up. No stiffening up as you’re busy styling. I always look back after circa half an hour or so to compare with the initial styling results: hair had not sagged, no loose hairs, splits or cowlicks popping out, no sides out of place. Hair shape I got is slick, neat and clean. Not much of a volume in my front but still a decent height. Big slick says: medium sheen. For me: few notches above neutral. Does it fade as other gel pomades do? No, It persisted. Medium-firm hold, a 6/10 according to Big slick. To me: medium. Once the water evaporates, I had no crunchy, hardened up feel at all: it settles, stiffens softly. Hair doesn’t move anymore. No annoying strays or flyaways. Keeps shape, minimal sag, waves in place, cowlicks too. A few flyaways and strays. No splits to discern. Pomade provides a good control. Mediumweight feel, soft feel allowing some average volume. Tested it while doing a few walks, a bicycle trip. It wasn’t windy, not sunny and temperatures in the mid fifties. I usually don’t restyle because a gel pomade locks in the shape. Restyling test: you can restyle on dry or on wet hair. I prefer wet. Wet for it’s slicker, get a shinier look and a hold about the same as before. My hair looked good after recombing it. Dry styling is possible, just a tiny bit of tension as you comb through but you have to be content with a more matte look and more loss of hold. Does not flake. Just water = water-soluble. Hair feels soft once it’s washed out. Most gel pomades dry out the hair but this one did a good job respecting my hair.